Analytical Routes to Chaos in Nonlinear Engineering discusses analytical solutions of periodic motions to chaos or quasi-periodic motions in nonlinear dynamical systems in engineering and considers engineering applications, design, and control. It systematically discusses complex nonlinear phenomena in engineering nonlinear systems, including the periodically forced Duffing oscillator, nonlinear self-excited systems, nonlinear parametric systems and nonlinear rotor systems. Nonlinear models used in engineering are also presented and a brief history of the topic is provided. 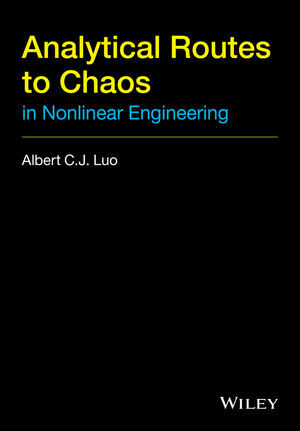 Analytical Routes to Chaos in Nonlinear Engineering is a practical reference for researchers and practitioners across engineering, mathematics and physics disciplines, and is also a useful source of information for graduate and senior undergraduate students in these areas. Professor Luo is currently a Distinguished Research Professor at Southern Illinois University Edwardsville. He is an international renowned figure in the area of nonlinear dynamics and mechanics. For about 30 years, Dr. Luo’s contributions on nonlinear dynamical systems and mechanics lie in (i) the local singularity theory for discontinuous dynamical systems, (ii) Dynamical systems synchronization, (iii) Analytical solutions of periodic and chaotic motions in nonlinear dynamical systems, (iv) The theory for stochastic and resonant layer in nonlinear Hamiltonian systems, (v) The full nonlinear theory for a deformable body. Such contributions have been scattered into 13 monographs and over 200 peer-reviewed journal and conference papers. His new research results are changing the traditional thinking in nonlinear physics and mathematics. Dr. Luo has served as an editor for the Journal “Communications in Nonlinear Science and Numerical simulation”, book series on Nonlinear Physical Science (HEP) and Nonlinear Systems and Complexity (Springer). Dr. Luo is the editorial member for two journals (i.e., IMeCh E Part K Journal of Multibody Dynamics and Journal of Vibration and Control). He also organized over 30 international symposiums and conferences on Dynamics and Control.